One of the original, more extensive pieces of wall text from the Paris run upon which the Field Museum version of the show based their edits. This has some additional problems, but actually in some ways the original version contains less problematic content than the Field’s version. I write these critical words as someone who was involved, in some small way, with each of the three iterations of the show. I feel it’s important to be transparent about my connections, because they factor into why I did not write a much needed critique of the original exhibition sooner. With respect to the Musée du quai Branly, I was recruited to write an essay on American tattoo history for the exhibition catalog for a small honorarium. I also spoke as part of the academic symposium that was held toward the end of the exhibition’s original installation; the museum offered airfare and lodging in exchange for participation. A curator from the Royal Ontario Museum in Toronto (the second venue) reached out to me when reviewing exhibit text to fact-check things; that turned into a tiny job spending a few hours giving them an editorial review of a limited portion of the didactic text. They incorporated some of my suggested edits, but met resistance from quai Branly staff with respect to amending some of the more egregious text. In July, when I heard the show was coming to the Field, I was particularly dismayed. I realized this problematic show had the potential of traveling far and wide, and I wanted to see if, given that inevitability, the content errors might at least be corrected. I have a long relationship with the Field that dates back to when I worked there as an intern in 1992-93. They have an amazing collection. My saliva is even on artifacts in the Maori House exhibition from when I was assigned to the conservation team during that project restoration/installation (believe it or not, that’s what we were instructed to use as a cleaning medium because it’s a gentle solvent!). I also faux finished some of the replacement carvings (I was a painting student at the time). I’ve climbed inside cases with taxidermied animals to clean up bits that had fallen off them. I love this museum and always enjoy visiting. So, I reached out to them several times to offer my services in further correcting the record, especially after a visit to Toronto at the end of that exhibition’s run over Labor Day weekend which revealed that the traveling show had become even more problematic than the Paris iteration. Only then did they take me up on my offer to meet with them and discuss some of the issues I and colleagues had noticed. They, like ROM, hired me to conduct an editorial review of a limited portion of the exhibit text and incorporated some of those edits. I also warned them about other items I had noted as problematic in addition to what they sent me which remain in the exhibition unchanged. Among the many artifact problems, a 19th century Italian lithograph (dated 1825 and signed with the lithographer’s name Muller) labeled in the Paris and Toronto versions of the show as an anonymous 17th century engraving. This one is worthy of its own blog post, which I promise soon. In both traveling instances, some of the most serious content errors occur in text I did not have a chance to review—some of this was text from the original version of the show and some newly created. My observations about poor curatorial choices (aired to the Field Museum only) could, for obvious reasons, not be acted upon (even if they wanted to) due to the late date on which they agreed to hear my concerns as well as contractual agreements. I feel terrible for the curators and staff who were tasked with working on the two satellite shows—they did not pick this show, they were handed it with a mandate from above. This speaks volumes about the way museums are often run these days—privileging “blockbuster”-type shows about popular culture that prioritize spectacle to get people in the door, while relying heavily upon reproductions and design aesthetics to deliver a pleasing experience with little substance beyond some neat artifacts and images being used as props. 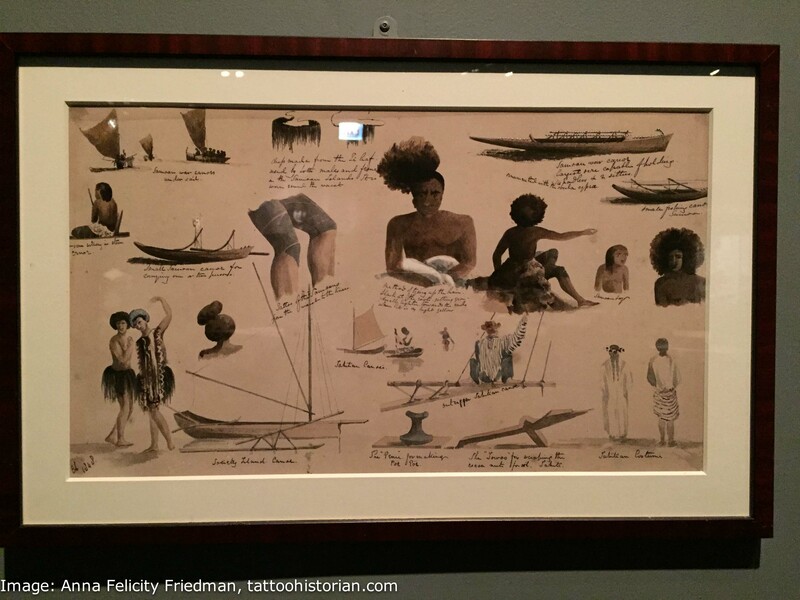 A “reproduction” of a 19th century watercolor featuring tattooed Polynesians. How this reproduction was framed as if an original is particularly problematic–it is being fabricated into a genuine artifact. As a former rare print curator, I well appreciate the issue of light fading antique colored artifacts. But many museums show originals by rotating what’s on display every few months (something that I know the Paris version of the show did in some instances, such as Japanese prints). There are so many original artifacts that could have been borrowed to fill this niche in the show. But that would have cost a little bit more money, not a ton, mind you, but a small sum. I would think that the visitors to a museum the caliber of the Field would deserve original artifacts, not reproductions. The label that reveals that this item, despite looking like an original artifact, is a reproduction. How many visitors will actually read this label to realize this? All my interactions revealed that the traveling-show host museums had very limited budgets to make changes. It also pointedly unveiled an almost hubristic arrogance by staff at the Musée du quai Branly (I’m not sure exactly who) to refuse to acknowledge that a great deal of the “scholarship” on which the original show was based used outdated and/or incorrect sources. 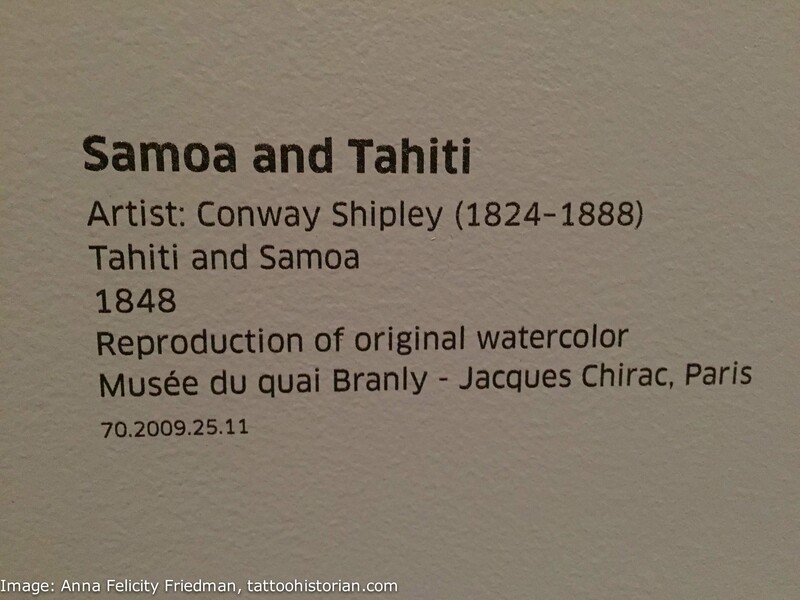 I will add that a portion of the research conducted by the support staff at quai Branly was high quality, particularly with respect to Sébastien Galliot’s Pacific Islander/Oceanic contributions—the original show benefitted from a much wider range of non-reproduction artifacts as well as additional didactic text to explain what viewers were seeing. I thank the curators and other staff at both the ROM and the Field for considering my edits—I know your hands were somewhat tied. Because of my involvement with the Paris version of the show, I was remiss in not writing a critique initially—I felt loyalty to the show for hiring me to write that essay and for transporting me to and housing me in Paris where I was able to participate in a mostly wonderful meeting of some tattoo-academic minds. I was reluctant to criticize a show that featured work by so many wonderful tattoo artists, even if the way their contributions were presented often miscontextualized them or used them as decoration. I also didn’t write about the show because I figured it was one and done. The symposium happened toward the end of the exhibition run, and I figured the show would disappear into the annals of history, easily forgotten as an attempt by a museum to tap into a popular trend. A perfect example of where this notion of “Western” tattooing residing on the “fringes of society” originated. This was one of the highlights of the Paris version of the show for me, which sadly did not travel to the other two locations–a notebook kept by Alexandre Lacassange, the nefarious criminologist, who is one of several people responsible for turning much elite/literary public opinion against tattooing in the late 19th century. 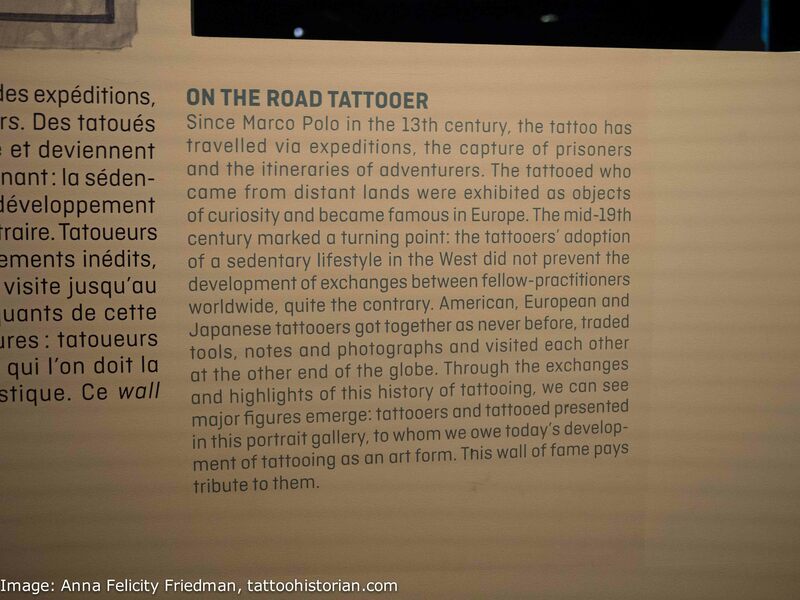 Urban myths based on his and other criminological writings from this time formed the basis for tattoo consternation from this time period through the 1960s with unfortunate resonances even today, such as the way “Western” tattooing is largely misconstrued in the three versions of the quai Branly tattoo exhibition. I was not prepared for what I actually witnessed: a jumbled assortment of tattoo artifacts that ranged from the wonderful to the problematic accompanied by didactic text riddled with content errors. Particularly for the “Western” (European and Euro-American) content, the curators seemingly relied on outdated sources, and I and other colleagues tracked some of the erroneous information to specific inaccurate books. In part, this is because the exhibition’s primary curators, Anne and Julien from Hey! magazine and performance group, are not academics but rather pop-culture journalists who have become minor French media celebrities. Over the past few years, Anne and Julien have occasionally curated shows that have been termed “carnivalesque” and “consistently bewildering”; these are completely excellent qualities in the right context, especially that of the avant-garde and low-brow art in which they specialize (and they do a great job with this). But with respect to an exhibition with aspirations of presenting a careful assessment of tattoo history, they just were not the right fit–they lack the training or experience that allows for proper evaluation of sources or to determine what makes a sound artifact choice from a curatorial perspective. I say this as someone who strongly believes that you don’t necessarily need a degree of any sort to do quality scholarly work. After working with Anne in an editorial capacity on my essay for the catalog and meeting the two of them, I found their dismissal of recent scholarship that counters their claims and their privileging of myth and marketing over such evidence to be shameful. Part of me wonders, in looking at other exhibits they’ve done, if Tatoueurs, Tatoués was an intentional stuntlike, eff-the-establishment show—one designed to mock the edutainment industry that churns out shows exactly like this: a handful of artifacts, many of them mediocre, supported by poorly researched text and focusing on design over content. If it was, I guess I commend them for that kind of insurgent brilliance, but it really does a disservice to all the people who arrive at the tattoo exhibition expecting an in-depth, carefully vetted view of tattoo history and who are not in on the joke. Did they indeed “force an abandonment of scientific observation”? I can see the appeal Anne and Julien presented to the quai Branly’s director. As spokespeople, their many body modifications make them quite photogenic. They have buzz behind them. They produce a glossy, hip magazine (established in 2010). They could offer personal connections to mine in the contemporary tattoo community due to their involvement in body-art subculture over the years. I’m not discounting their important role in disseminating and normalizing subculture and non-establishment art in France, but these are not people who should have been granted the honor of curating a major museum show. Among the most egregious of text panels in the original Paris version of the show. If any of you follow my work, you’ll easily recognize the errors. 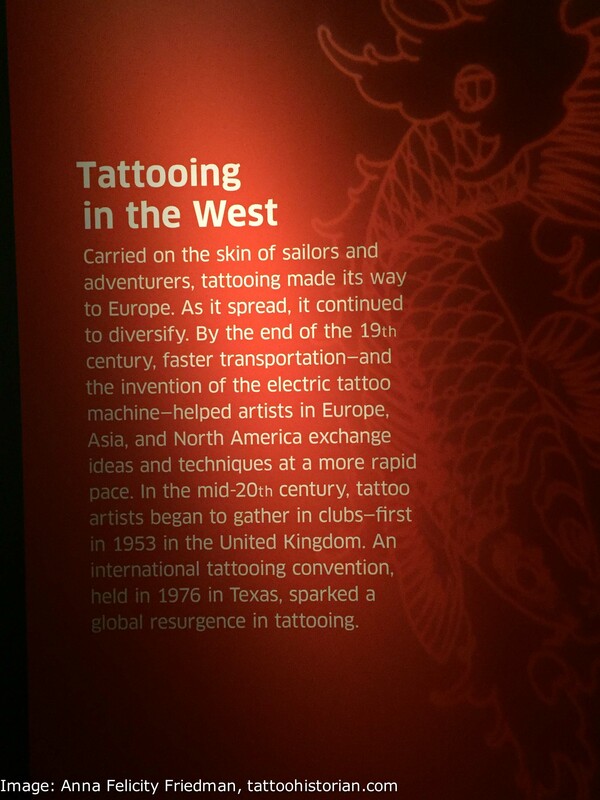 I could write an entire blog post on just this text panel alone, but suffice it to say that the repeated assertion here that most of European tattoo history related to marginal practice ignores ample evidence that tattooing was practiced on a diverse roster of Europeans for myriad reasons over millennia. I have considerable empathy for the plight of the people involved with the various versions of this show. I’ll be the first person to admit that I’ve made errors in things I’ve written or exhibits I’ve curated. It happens to all of us. New research can come to light after someone has written or curated something, or we rely upon an untrustworthy source that we should have recognized as such (in fact, this happened with my essay for this show’s exhibition catalog—I should have known better than to use Alan Govenar’s work for even something so seemingly easy to corroborate as a birth place). Staff are pressed for time and overworked; they have to cut corners to finish on deadline without doing due diligence to send something out for the kind of review that would catch errors, if limited budgets even allow for such expense. But what has been particularly shocking to me about this trio of tattoo exhibitions is the sheer volume of fact-checkable bits of information that are just flat-out wrong. It’s not just a few nitpicky things that only a deep scholar could determine. I’m not talking about issues that are a matter of opinion or that could be argued either way. There are dozens of things that are just not right. To both the Field Museum and the ROM’s credit, they did fix some errors via editorial review, but so many more went uncorrected. But even after outside auditors (myself and others—I was not the only one) reviewed selected parts of the exhibition texts and image choices, errors persisted due to an unwillingness on the part of the Musée du quai Branly to change the content as well as a lack of comprehensive review on the part of the hosting institutions. These numerous, often egregious, content errors repeated through all three versions of the show heap insult upon injury. Among the persistent errors–the notion that knowledge of tattooing was somehow “lost” to Europe and needed to be “rediscovered”. This wall text is from the ROM version of the show. 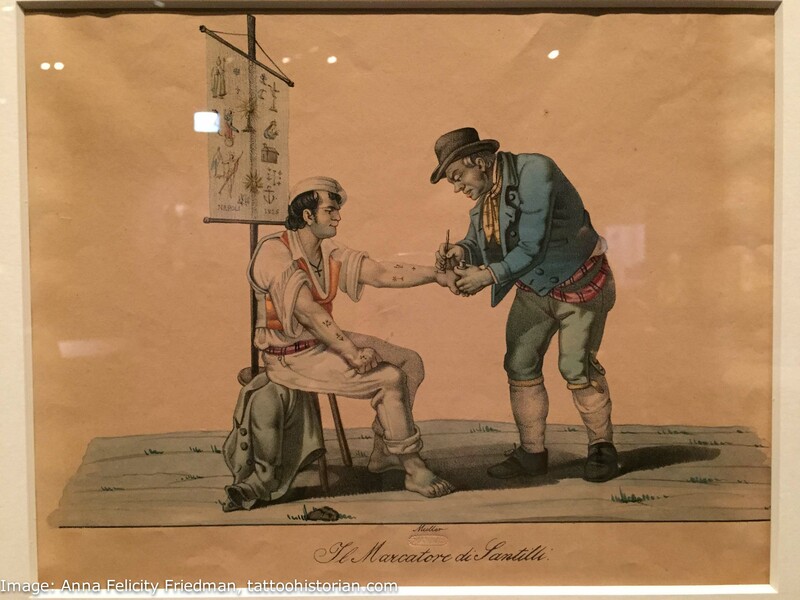 And the same fictional notion of European tattoo loss and re-importation via non-European cultures repeated here in the second panel that you see when entering the Field Museum’s version of the show. This ignores a wealth of evidence re: knowledge of and practice of tattooing by Europeans both pre and post 15th century for non-individual and non-fringe reasons. A critique of the misinformation in this text panel also could form an entire, lengthy blog post. Upon viewing the significantly pared-back traveling version of the show in Toronto, I noticed another issue. The exhibition’s labels often struck a tone that smacked of colonialism, exploitation of tattooing for carnivalesque pleasure, and exoticism—something hard to believe from an institution that showcases artifacts from diverse global cultures. To their credit, the Field Museum addressed this with respect to “non-Western” cultures in the current version, but bewilderingly treated the historical “Western” material through lenses colored by stasis, essentialism, and exoticism. I guess it’s okay to “other” historic practice if it’s one’s home culture? 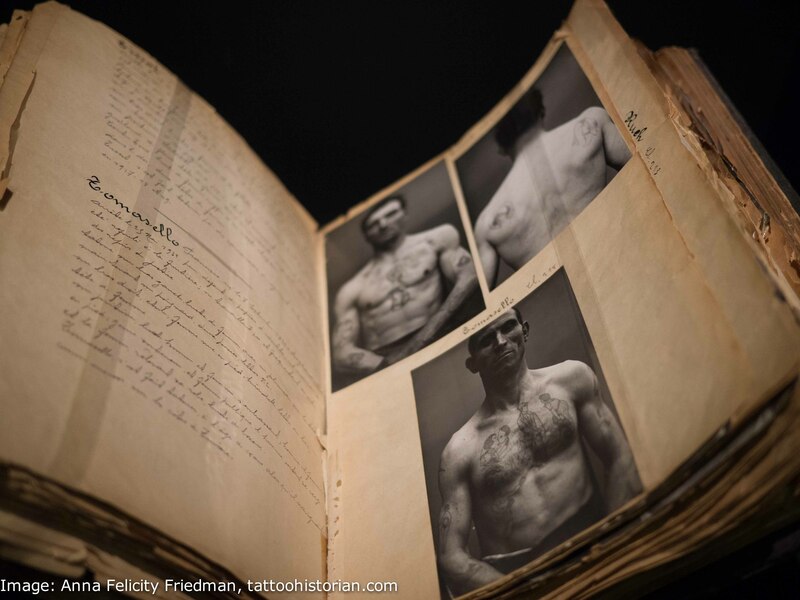 The writing about European and Euro-American tattoo history in the exhibition in all three of its iterations smacks of the writings of nineteenth-century criminologists who presumed all tattooing to be a marker of atavism. It tells an incredibly limited and regressive story about these collected cultures’ tattooing—one that aligns with common media myths about tattooing as “not just for sailors, criminals, and bikers anymore” when the diligent research by so many contemporary tattoo scholars shows diverse tattooing practice in Europe from at least 3300 BCE and quite possibly before. I’d encourage anyone who is interested in this pre-20th century history to read the chapter introductions to my recent World Atlas of Tattoo (with a note that research by some of my colleagues after the book went to press determined that Ötzi the European tattooed “iceman” carries the oldest specimens of tattooing on his body, not the Chinchorro mummy mentioned in the book—as I mentioned above, scholarship marches on and details can change, but we must acknowledge these corrections when alerted to their presence). Let’s move to one of the other baffling aspects of this exhibition: the limited presence of women. Women, arguably, have worn and inscribed tattooing at rates equal to men when we look at tattooing through time and across geographies. Out of the objects and images (not including the three videos) in the Field Museum’s version of the show only 31 (possibly 32–one of the African figures is possibly female) either show tattooed women (sometimes in groups with tattooed men), relate to female involvement in tattooing, or were created by female tattooers. Some of the women-related items duplicate content, for example 4 separate items relate to Filipina tattooer Whang-Od, 2 artifacts depict tattooed woman Rusty Field, three images of Algerian women’s tattoos comprise a set, and 2 paintings of tattooed ladies by Titine Leu form a pair; so by another counting method that itemizes groups of artifacts/images as single contributions, the number of women’s tattoo items drops to 23. The Field Museum notes 125 objects in the show in their press release. I’ve counted 177 separate items, so the Field may be grouping some things together in that count or not including the reproduction images in the object total. At best about 1 in 6 items in the show relates to women in tattoo history and culture in some way. At worst it’s nearly 1 in 8. (Things get even worse if you count individual images of tattooed people such as in the selection of photos of tattooed Bat’ d’Af soldiers–more on that artifact in a later episode of this multi-part critique, as it features a woman among them, who was decidedly not a Bat’ d’Af soldier!). With respect to the contemporary material that was commissioned by the Musée du quai Branly presumably under the direction of Anne and Julien since contemporary art is their specialty, not a single silicone sculpture was commissioned from a woman; the only female presence among this selection of silicone “artifacts” is a headless female torso tattooed with a man’s hand on one of her breasts (you can’t make this stuff up). Only 2 of the 20 back piece art commissions that are on display in the Field’s version of the show were created by female tattoo artists–women may still be woefully underrepresented in the persistently machismo-infused contemporary tattoo world, but their numbers are far greater than 10 percent. Just 4 of the dozens of photographs in the exhibition were taken by women in the Field’s version of the show. Two paintings of historical tattooed women were painted by a female artist. Two women are included as artists in the popup tattoo shop. Women also occasionally appear in depicted tattoos/artworks 22 times (some of these have overlap with the above list as female makers sometimes represent women), These women-as-decoration are often sexualized or representative of their use as objects of the male gaze. In the 21st century, an institution the caliber of the Field Museum should be far more attuned to making sure women receive equal and respectful representation, especially when there is ample archival material out there to include them. I’ll also say that counts of items at the other versions of the show resulted in similarly terrible results. I’ll remind you all that one of the two main curators of the original show was a women. How on Earth could women have been so underrepresented? What I hope to offer in Part 2 of this critique is an item-by-item accounting (artifacts, labels, and text panels) of what’s problematic from each of the three versions of the show. In the meantime, I’ll share my extensive documentation from my visits to each. I’ve not had time to do much of anything with these images in terms of adjusting exposure levels so they are easier to see. I took more images at the first and third versions than the second. They are loosely arranged according to a logical walkthrough of each exhibit, but with respect to the Paris version, there is some backtracking and with respect to the Toronto version there was no clear trajectory through that installation. So feel free to browse this Dropbox folder. And if you notice anything awry, don’t hesitate to reach out to me. I’ll be compiling annotations on each image and plan to make these annotations public and can credit other people’s fact-checking in the annotations (I’m hoping to make a crowdsourced spreadsheet or a Google form, but in the meantime, feel free to use the “comment” function in Dropbox to alert me to any problems/errors you might see). If you have images of items I missed, feel free to send them to me, and I can add them to the archive—put your name in the image file name to act as a way to ensure credit to you or watermark your images. Despite my clear anger and consternation over this show, I will conclude by saying it’s still worth seeing for a few real highlights (the Paris version had more such highlights, due to its higher proportion of actual artifacts rather than reproductions-as-artifact). It also offers a lesson in evaluating real artifacts as compared to reproductions and tests critical thinking skills with respect to processing presented “information”. Kudos are in order for the Field’s design team for putting lipstick on a pig—the design of the show is beautiful. So if you go, be wary of the text, be critical of the artifact (and “artifact”) choices, and approach the exhibition from a place of “hey, that was a cool collection of tattoo-related stuff” rather than an opportunity for any sort of deep education. Thank you, I appreciate the information you are freely sharing. Your insight is profound and I enjoy the depth of your analysis (while I don’t agree 100%). We miss an opportunity for honest preservation when we allow crash and burn sensationalism to overtake our history… though the cultural affect of handing down oral tradition and folk custom is crucial to the craft, tradition etc.. and shouldn’t be overlooked either, but I agree it should be handled as such… It’s a sad day for the Field to disregard/underrepresent women in the context (even) of modern tattooing) when they were keepers of the flame for many generations and integral to the preservation of the practice (Kurdish Deq still have non divorced women or nomadic gypsy women make their permanent marks with lamp soot and breast milk)… Sorry to be so shallow with this comment, but I really really want to thank you for your time and commitment–very appreciated. I look forward to reading more in depth after work tonight. I will venture up to see the exhibit (when I can get a moment away from my own shop)… but I was really looking forward to a deep exploration and a broader world view, outside of my own context– my expectations have been adjusted. Thnak you!